Our Artistic Mission is to pursue excellence in the presentation of diverse repertoire, through innovative original productions and detailed performance practice, and to provide opportunity to artists throughout Canada at all stages of their careers, from student to mentor. In doing so, we will advance and preserve the traditions of our art form. 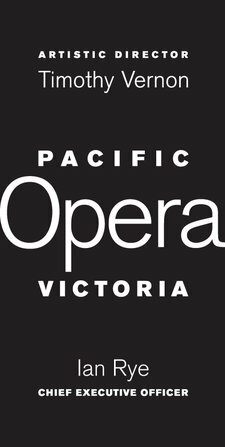 Our Community Mission is to engage diverse audiences from Vancouver Island and beyond in the communicative power of opera at performances and imaginative community events, and to encourage the use of opera as a resource for educators to enrich the learning of young people. In doing so, we will play a leadership role in enhancing the vitality of life on Vancouver Island. Our Financial Stewardship Mission is to invite wide public and private investment in our activities by building strong relationships with our supporters, thoughtfully stewarding our financial resources, and ensuring effective, renewable leadership from an ensemble of Board, Staff, Artists and Volunteers. In doing so, we will ensure that our company remains dynamic as an institution of lasting importance.